(Beyond Pesticides, April 3, 2017) The European Union (EU) has approved a $130 billion mega-merger between two agrochemical giants, Dow Chemical Company and DuPont Company, heralding a new round of takeovers that environmental and farm groups fear will reduce farmer choice, seed diversity, and endanger the future of sustainable food production. The consent to the merger was given with the requirement that Dow sells off its pesticide business, which it plans to do as part of a $1.6 billion asset swap with the FMC Corporation, a pesticide manufacturer. The Dow Chemical-DuPont deal is one in a series of mergers in the agriculture-chemicals sector being considered in the EU and also the U.S. The Dow-DuPont merger is happening alongside proposed mergers of Bayer and Monsanto, and Syngenta and ChemChina. On March 27th, a letter signed by 200 organizations across Europe was delivered to European Competition Commissioner Margrethe Vestage. The letter says that about 60% of commercial seed supplies will be centralized in the hands of just three multinational corporations if the mergers are all approved, and calls on EU regulators to step in and stop the deals and protect European farmers, and the European food system. The letter, organized by Friends of the Earth Europe, notes that the mergers of Dow and Dupont, and others, will“exacerbate the problems caused by industrial farming –with negative consequences for the public, farmers and farm workers, consumers, the environment, and food security.” Additionally, reduced diversity of farming, and greater dominance of monoculture farming highly reliant on chemical inputs, including hazardous pesticides, brought on by consolidation and concentration in the agricultural sector, will further harm the environment, biodiversity, and human health –including that of farmers and workers, the letter also states. As a condition for the deal, DuPont is selling off large parts of its global pesticides business, including almost all of its global research and development group. But the U.S. agrichemical giant is the second biggest global seed supplier after Monsanto, and there is concern that just three mega-corporations could soon be left exercising a monopoly over the world’s food and countryside, leading to higher food and production costs, since Dupont’s assets will be bought by another agrochemical giant. In response to the latest European developments, the National Farmers Union (NFU) sent a letter to President Trump urging him to oppose the merger, citing a reduction in competition that will result in less innovation, higher prices, and less choice for family farmers. “We are currently in the midst of a third wave of consolidation, as the Dow-DuPont merger is happening alongside proposed mergers of Bayer and Monsanto and Syngenta and ChemChina. In 2007, the four largest agricultural biotechnology, seed, and chemical firms controlled approximately 72% of U.S. markets for corn and soybean seed,” NFU writes. The group also notes that the merger will limit farmer choice, as there will be a reduction in seed diversity and availability that will impact farmers differently on a geographic basis. Seven U.S. state attorneys general (AG) have expressed concern and joined together to investigate federal antitrust concerns related to the merger of Dow Chemical and DuPont. This investigation by the state AGs will increase scrutiny of these mega deals, as they were previously only being reviewed at the federal level by antitrust experts at the Department of Justice (DOJ). Since DOJ has yet to file a lawsuit opposing the mergers, groups and individuals who want to see the mergers blocked are thrilled to see the states get involved and urge DOJ to act. The discussion on these mergers began back in December 2015 when DuPont and Dow Chemical Companies announced that their boards of directors unanimously approved a merger of their companies through an all-stock deal, valuing the combined market capitalization at $130 billion. 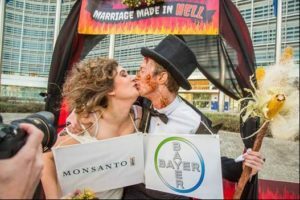 Then, in May of 2016, Bayer AG made its first bid for Monsanto, worth $42 billion, in an attempt to swallow the global seed and chemical producer and become the world’s biggest farm chemical supplier. Though that initial bid was initially rejected, Bayer and Monsanto eventually reached an agreement in September 2016 to the tune of $66 billion. A third industry merger between China National Chemical Corp and Syngenta AG is also in the works, having received the go-ahead from the Committee on Foreign Investment in the U.S. (CFIUS). However, the ChemChina-Syngenta merger is unlikely to be investigated by state AGs, as it does not involve a U.S. company. Europe is widely expected to clear another union between Syngenta and ChemChina in the next two weeks, with notification of a marriage between Monsanto and Bayer expected later in the year. Regulators in the U.S. and China will still have to approve the Dow-DuPont deal, but last week’s EU decision is being seen by some analysts as a marker for future deals. Wondering how to get involved in opposing the agrochemical industry mergers? Reaching out to your U.S. Senators and Representative to ask them to reject the approval of a merger that consolidates seed availability, and encourage them to instead focus on increasing the availability of organic seeds, which do not negatively affect soil, water, or human health is a good way to start. Additionally, reaching out to your state AG office and encouraging them to join the merger investigations is another way to ensure the DOJ takes action to block the mergers. Finally, you can educate yourself on organic practices, which work to build the soil and maintain an ecological balance that makes chemical fertilizers and toxic synthetic pesticides obsolete. This entry was posted on Sunday, April 2nd, 2017 at 12:00 am	and is filed under Announcements, Corporations, Dow Chemical, DuPont, National Politics, Pesticide Regulation, Take Action. You can follow any responses to this entry through the RSS 2.0 feed. You can skip to the end and leave a response. Pinging is currently not allowed.